It was a cold morning, something around 16F, which was about the temperature at the start of Flying Monkey. The Start/Finish of the race was on the property of Alcoa Middle School which allowed us to use their gym facility. So instead of hanging out in the car, or walking around outside, we could stay warm inside and be as relaxed as we could get. The Junior ROTC from Alcoa?? Middle School was the Color Guard to present the flag for the singing of the National Anthem. There were only a few pre-race announcements before we headed out to the get the race started. 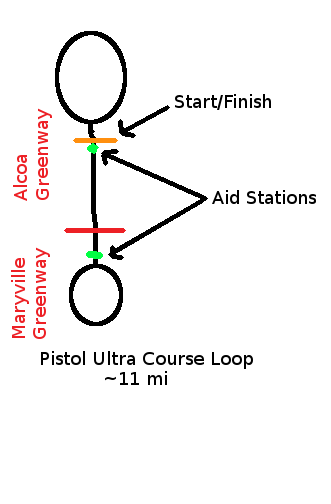 The course for the Pistol Ultra consisted of an out-and-back configuration of two circles connected together, much like two lollipops connected stick end to stick end. A whole loop was approximately 11 miles and the 50k runners were to run 2 full loops and then an augmented out-and-back to complete the mileage. The course loop was on entirely greenways with a few road crossings at various points along the loop. 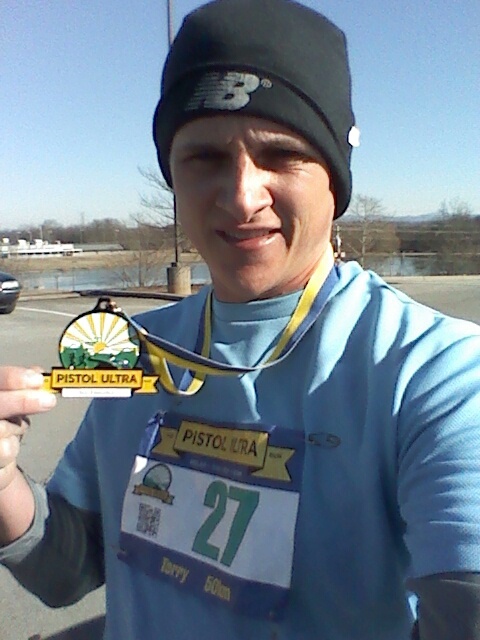 About 2/3rds of the course was on the Alcoa Greenway with the other third on the Maryville Greenway. The Alcoa Greenway has a more rural feel to it as it is follows closely beside Pistol Creek (Hence, the name of the race). Once the Greenway changes to the Maryville Greenway, it is a more urban flavor as it courses around the Duck pond of the great city of Maryville (which to pronounce correctly in East Tennessee sounds like “Murhh-vulle”). I was pretty anxious walking around the race start, as this was my 50k race, were I to finish this race, I could be called an “Ultramarathoner”. 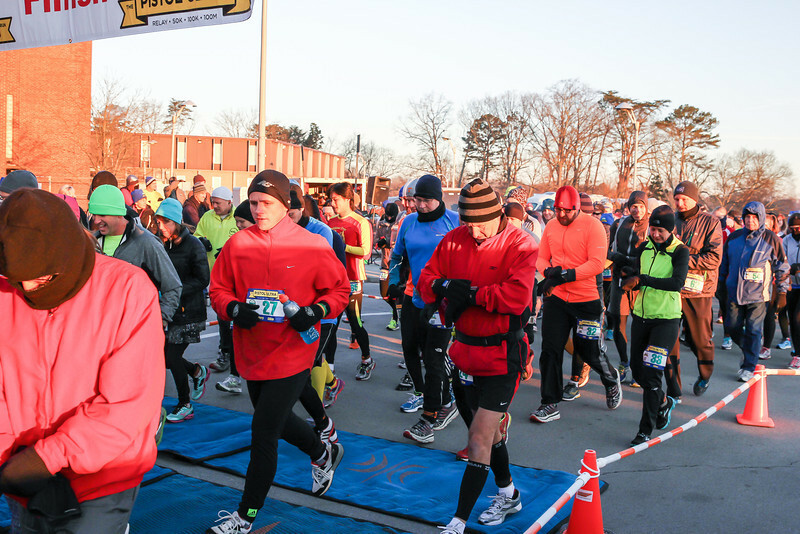 However, with ALL races, no matter the length, there is electricity in the air and that tends to bends one’s focus away from trivial matters of finishing a race and more important things such as starting the race. Go geared up with 2 packs of Clif Blox, 2 Accel gels, and a 24oz Gatorade bottle, I was ready to attempt my first ever, 50k. The strategy I had planned for the race was to run for 9 minutes and then walk for 1. The most important part of this would be that it would force me to slow down at the start of the race. The starter’s pistol released its yell and the race was afoot! The strategy I actually followed was not what I had planned. Instead of using a run/walk strategy, I opted for the run until you can run no more strategy. What I was most concerned about was that I would be starting off too fast, thus having to take walk break sooner. It turned out that I did find a pace that was slower than my usual marathon pace, however, it would still be too quick. I would find that out in the next loop. I was familiar with the course, as I ran these greenways in years past and that was to my advantage. The first couple of miles, as the greenway dropped down by Pistol Creek, the temperature must have dropped 5-10 degrees cooler. There were places along the greenway where water had pooled and frozen over and still frozen. Once on the Alcoa greenway, the few hills on the course presented themselves to taunt the runners. However, short work was needed for these short hills. Part of the greenway ran alongside the back of some buildings and some curious people asked what was going on and how far we were going. Passing the first aid station, I realized that I wasn’t really hungry, but I knew that I should eat nonetheless. I grabbed a half banana at the aid station and broke open my pack of Clif Blox. I ate two of the Clif blox around the turn around. Once I came back around to the aid station, I filled my gatorade bottle with some Strawberry HEED drink (but I do like Mandarin Orange HEED). It wasn’t all that bad, but it wasn’t all that great. Shortly into Lap 2, I started to take walk breaks. I had wanted to push back switching to run/walk as long as I could, but given this was going to be a new distance for me, I thought it better to be preemptive in saving my legs. I ran alone for most of this lap, but I could still see runners ahead of me. I didn’t eat/drink much this loop either. I still wasn’t hungry and forced myself to drink and make sure that I had a full bottle of liquids with me at all times. At the water station, it was still cold enough that the table that held the cooler for us to get water/carbo drink was frozen over with a layer of ice from the liquids that spilled. I found out that I don’t particularly care for GU’s Lemon Lime carbo drink. Knowing that the last lap (for the 50k) was a shorter lap, even if just a short distance, was a mental boost. I had ditched my fleece outer layer. It was still cold down by the creek at spots, but most of the course was getting warm, at least enough to shed a layer. I could manage the colder temps with just a hat and gloves for the short term, then take them off without having to worry about overheating. And then, I pasted the 26.2 mile mark with 4.8 miles yet to go. All I had to do was finish and could add “ultra marathoner” to my list of things people could call me (this better than some other things people call me). Most of this lap, another runner and I were passing each other in a leap frog fashion. She would pass me, then start walking and I would pass her. Then I would start walking and then she would pass me. On the return leg of this last loop, when she started to pass me, she stopped and said, “Let’s finish this thing”. We chatted for the next 3 miles, taking much fewer walk breaks while maintaining a decent pace. If you have read some of my race reports, you know that I am kicker when it comes to finishing race. In the last couple hundred meters, I will use up any excess energy to pass runners at the finish. I even practice this “fast finish” technique on some of my training runs. This was my first ultra and as I stress for first time marathoners, it is about finishing, not time. Enjoy the experience, don’t try to kill yourself at the end, you automatically get a PR and unless you are battling for an award, don’t worry. This was the longest time, by about 2 minutes, that I had ever ran in one day. My previous record was 5:41:10 at the 2010 Flying Monkey Marathon. So now the question is would I do another ultra marathon. The answer is yes, I would. However, I highly doubt it would be much further than a 50k. 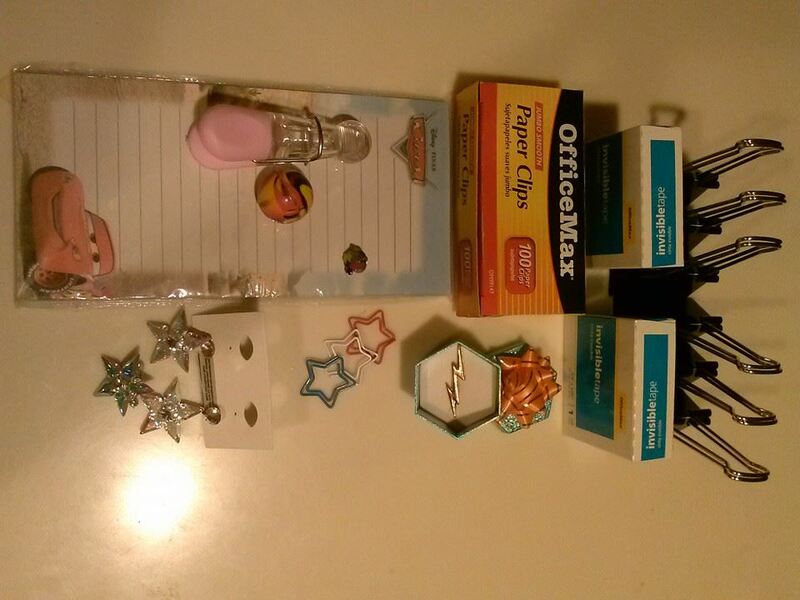 Kim Hale won the Guess My Time, Win Crap – Pistol Ultra Edition with her guess of 5:42! This entry was posted in running and tagged pistol ultra, race report. Bookmark the permalink.